Sun Pictures is organising a Petta Poster Contest from 08.02.2019 to 12.02.2019. The contest is open only for residents of Tamil Nadu only, who have completed 18 years or more and residing in Tamil Nadu as on the date of entering/participating in the Contest. Contest is applicable only to the Followers of SunPictures Twitter, Facebook & Instagram Page. The Contest starts on 08.02.2019 at 06:00 PM and ends on 12.02.2019 at 11.59 PM. The Contest hours would commence from 06:00 PM and valid till 11:59 PM, i.e till 12.02.2019. 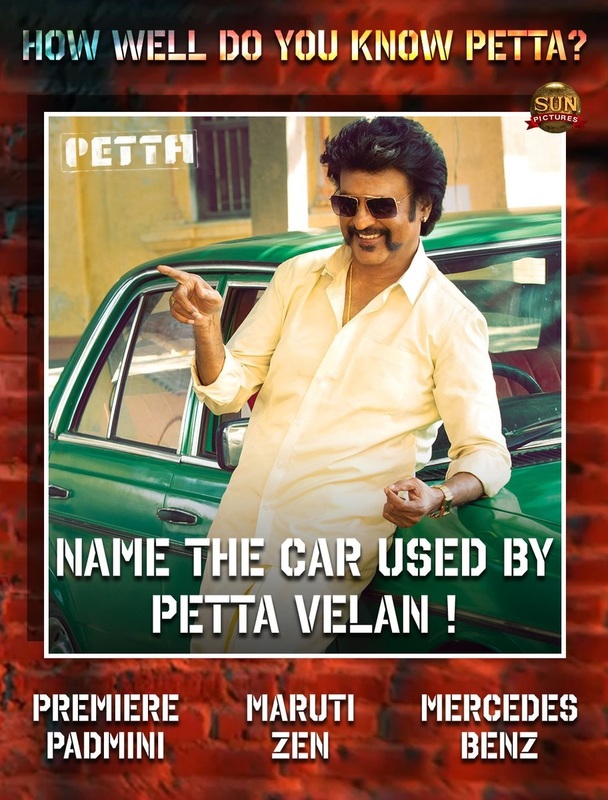 ** “SunPictures Twitter, Facebook & Instagram Page” will ask 5 questions from 06:00 PM till the contest end time based on the movie “PETTA”, or its Crew / Star Cast. ** On the contest period, 5 questions will be asked to the followers on SunPictures Twitter Official Page https://www.twitter.com/sunpictures , Facebook Official https://www.facebook.com/SunPictures/ & Instagram Official Page https://www.instagram.com/sunpictures. ** 10 winners will be selected for each questions and a total of 150 winners will be selected during the contest period who had answered the questions correctly. ** Each winner will get an Autographed Poster from Petta crew member. ** The followers have to answer each question separately. ** The followers have to type the correct answer in the comments list below the specific contest post on SunPictures Twitter Official Page https://www.twitter.com/sunpictures , Facebook Official https://www.facebook.com/SunPictures/ & Instagram Official Page https://www.instagram.com/sunpictures/. ** The followers have to type the correct answers in the comment section of the contest post before the end of the contest, which is 12.02.2019 befoe 11:59 PM. ** For Ex: If the contest questions are asked on SunPictures Twitter Official Page https://www.twitter.com/sunpictures & Instagram Official Page https://www.instagram.com/sunpictures/ on 08.02.2019 at 06:00 PM, the answers have to be sent on 12.02.2019, before 11:59 PM itself, to be eligible for winning an Autographed Poster from Petta crew member. ** Followers can comment any number of times to participate in the contest. Sending more number of responses to the same question does not mean the eligibility of winning is higher. ** The winners will be chosen as per the sole discretion of STNL and only the selected winners will be informed by our STNL Team. ** If a Contestant is choosen as winner from Facebook the same contestant shall not be considered for the contest in other two platforms (Instagram /Twitter). ** STNL Holds no responsibility or liability in case the winner/winners fail to be contactable by STNL on the day of the results being declared by STNL for any reason, having made despite the best efforts of STNL. ** A Maximum of 3 attempts will be made to contact each winner by STNL. In such a case, STNL shall not be liable to prove the efforts made in this regard. ** Winners will have to come to a designated location at a specified time to collect the gifts. The location and time will be decided by STNL and informed to the winners at the time of call. 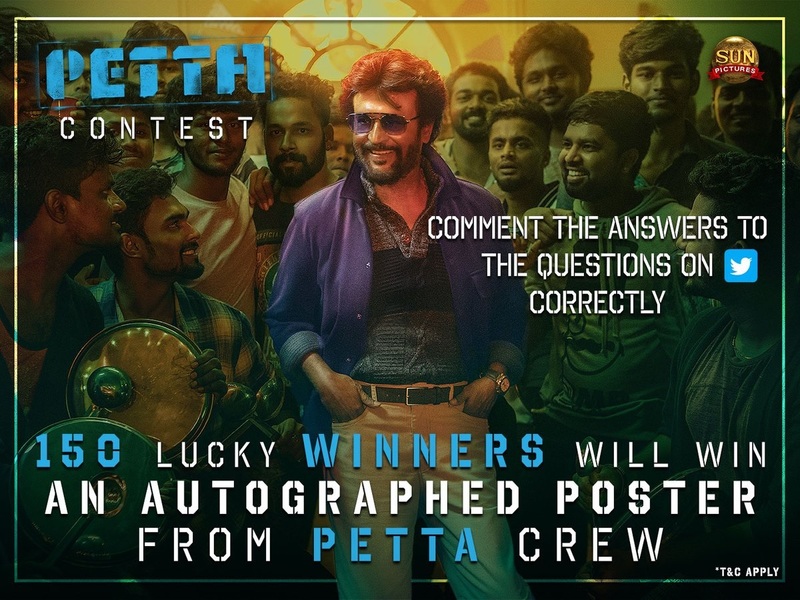 STNL will give out an Autographed Poster from Petta crew member for Winners of the PETTA Contest. The prize shall be given to the winner on production of valid documents of Photo and ID proof. The winners may be required to sign the Terms and Conditions herein before accepting the prize. Any failure on the part of the winner to comply with directions issued by STNL, shall entitle STNL, in its own discretion to cancel and forfeit the prize for the said winner and then the same prize will be given to the next eligible winner. ** Any interim reliefs sought under Arbitration shall be subject to the exclusive jurisdiction of courts in Chennai city only. ** STNL at its sole discretion may also waive production of any of the aforesaid documents. ** This Contest is subject to force majeure circumstances i.e. act of God or any circumstance beyond the control of STNL. ** The Contest is valid subject to the winner complying with all terms, conditions and/or formalities as required by STNL. ** Participation in the contest implies acceptance of all the terms & conditions associated with the contest.